2 bedroom cottage retreat in walkable neighborhood - Affordable and Fun! 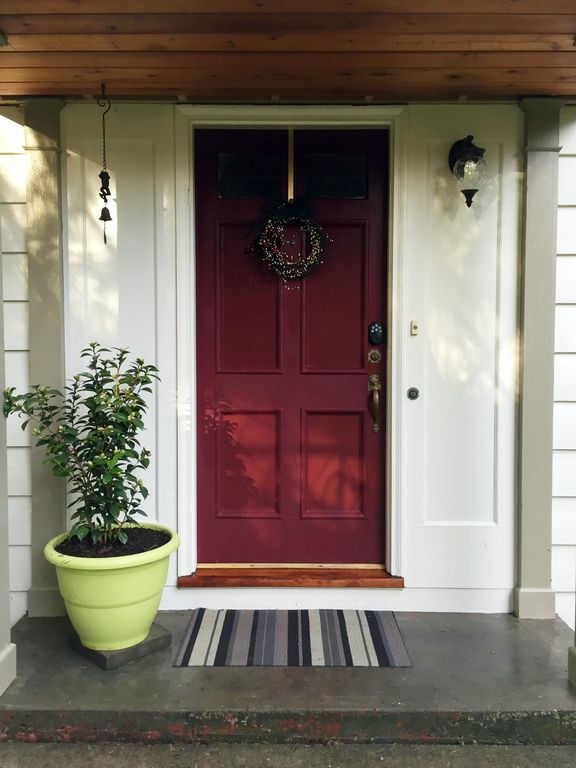 Our charming private cottage, just 15 minutes from downtown Portland, is located in the desirable First Addition neighborhood of Lake Oswego. It's an easy walk to Lake Oswego restaurants, boutique shopping, multiple parks, movie theater, library, post office, grocery stores, state park hiking trails, the Willamette River. This newly renovated home is full of character and well equipped for a relaxing stay. There are beautiful refinished hardwood floors throughout and the living room features a cozy fireplace and smart TV with cable and wifi. And because so many have asked: yes, sports lovers, there is ESPN! The dining room takes in a french door view of the expansive back yard where you can grill out on the patio or gather around the firepit. The master bedroom features a beautiful artisan-made sculptural bed with a queen Tempurpedic mattress. The second bedroom has a trundle day bed that neatly converts from twin to queen to accommodate 2. A queen sleeper sofa in the living room completes the sleeping arrangements for a total of 6 people. There is one efficient full bath with tub/shower. Our renovated kitchen comes fully-equipped with all new appliances and cookware. Not in the mood to cook? It's just a short walk to a variety of local restaurants. There is ample parking and a garage as well as washer and dryer for your use. Everything you need for a relaxing vacation stay is provided all on one level. In town on business and looking for a hotel alternative? Free wifi will keep you connected and productive in home away from home comfort. Located just 6 blocks from the TriMet public Transit Center with excellent access to I-5, I-205, and Highway 43, you can get where you want to go quickly and easily with or without a car. Enjoy shopping? Explore small neighborhood boutiques as well as national specialty retailers including Sur la Table, Chico's and Pendleton just a 10 minute walk away. In search of entertainment? Downtown’s Millennium Plaza is host to the popular Farmers’ Market plus many community and entertainment events throughout the year. Lakewood Center for the Performing Arts offers a plethora of classes, plays, and events and the Lake Theater and Cafe is the local cinema in town. Plus you wont want to miss the renowned outdoor sculpture walk. Looking for a park? You can easily walk to a different park each day of the week. Be sure to visit Foothills Park, Millennium Plaza Park, George Rogers Park, Tryon Creek State Park, Roehr Park, Rossman Park and Sundeleaf Plaza. Visiting friends or family? Our cottage is near Lewis and Clark and Marylhurst Colleges as well as the neighborhood Adult Community Center. Want to be active? Other local recreation opportunities include Lake Oswego Public Golf Course and Range, Indoor Tennis Center, Luscher Farm, miles of state park hiking trails, cycling around Oswego Lake, and more. On holiday in the Portland area? Located just 8 miles south of Portland, you have easy access to all “The Rose City” has to offer including: Portland Art Museum, the trendy Pearl District, Japanese Gardens, Oregon Zoo, Portland Children's Museum, Portland Aerial Tram, Forest Park, Pioneer Court House Square, Portlandia, Keller Fountain, Portland State University, Portland Center for the Performing Arts, Tom McCall Waterfront Park, the 11 bridges of “Bridgetown”, and the Rose Test Gardens. You will find tons of live theater and music to choose from every night of the week. We welcome you to our cottage! Jim and Carol have owned their cottage for 23 years. We love to travel both domestically and abroad and know that staying in comfortable unique place can make a vacation magical. We can be found cycling through the neighborhood, hiking through Tryon Creek, eating at a favorite restaurant, or attending one of our children's many school and sporting events. Proximity to parks, access to Portland, and a safe friendly community with great schools attracted us to this neighborhood over 23 years ago. We love it and have raised a family here taking advantage of all the community has to offer. We still live just 5 blocks away and are here to help you enjoy exploring the beautiful northwest from the comforts of our sweet cottage. Small, yet cute and clean. Add a leaf to seat more. Very convenient to shopping and restaurants. Found a great gluten free bakery, Kyra's near by. We had a wonderful stay in this cottage, everything was in order, it was clean and comfortable and it a great part of Portland. The owners were very responsive to any questions we have. I would defiantly here stay again. This cottage was adorable. Great location, beautiful neighborhood, everything you need is right there. Quaint and perfect for 4-5 people. Would stay here again in a heartbeat! We stayed in this nearby cottage while the floors in our home were being re-done. We know the area. The cottage is located in the quaint historic "First Addition" section of the affluent Lake Oswego community. There is easy walking around the neighborhood of darling cottages and restored homes, plus trail hiking in Tryon Creek Park is just a few blocks away. The layout is perfect for a couple or small group. We had everything needed for a 5 day stay and found it much more comfortable than staying in an extended stay hotel suite. Cute house with very large back yard. Very clean. Easy access with the keyed entry. We didn't use it to its full potential. Just needed the bed and bathroom. Never even used the kitchen. It also had a washer/dryer which would have been used if we had been staying longer. Would have liked coffee, but regular drip machine and I guess we are supposed to bring our own. Little K-Cup machine with a couple of supplied pods would have been nice, or even a tea bag or two. It was a nice, cute little cottage and would definitely stay again. recommend this cottage for your next trip to the Portland area! Our cottage is located in a walking friendly neighborhood with close access to hiking trails, restaurants, boutique shopping, movie theater, library, post office, banks, grocery stores, multiple parks, seasonal farmers market, the Willamette River, and Oswego Lake. Just 14 minutes to downtown Portland and an hour to the beach or Mount Hood you will be perfectly located to explore all the Northwest has to offer.